Stop the world – I’m having a moment. I heard recently that we are going to have fitted sheets on our hospital beds. Fitted sheets! How has it come to this? Whatever will become of the hospital corner? The very first thing we learned as nursing students was how to sew our lacy hats, then hot on the heels of the headgear came bed making. I had expected by this time to learn something about patients, but uniform and hospital furniture came first. We had to hone our bed making to perfection, completing the task in three minutes, with the hospital corners symmetrical, the pillow cases with the open edge facing away from the door and the wheels of the bed straight. Never ever, we were instructed, make a bed on your own. This was considered the last word in time-wastage, precious minutes gone forever. We listened, wide-eyed, getting the impression that to mislay the patient in this whirl of starched sheets and militarily lined-up linen would be considered preferable to the loss of those few moments. We did not understand then, of course, the crazy busyness of a hospital ward and that these were wise words – every second did indeed count. Then there were draw sheets – long out of fashion now – pulled through to invigorate the bottom-to-bed experience and useful for turning people. But it was the hospital corners that were icons of our profession; smart, efficient and orderly yet understated, everything that nurses were expected to be. And now they will be replaced by elastic. It totally makes sense. We should have done this years ago, but I can’t help but mourn their passing. 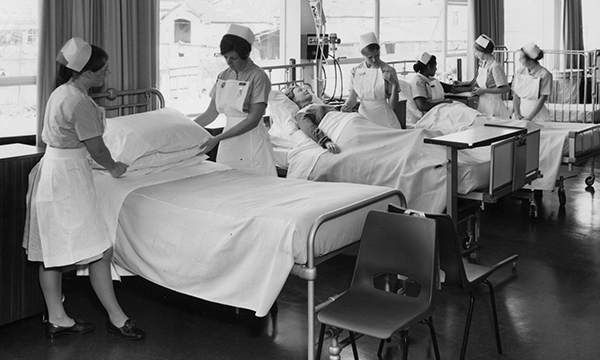 With 100 years of learning disability nursing behind us, what is next?